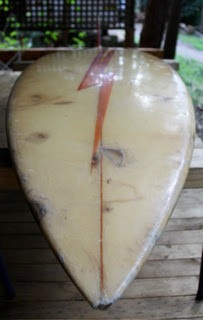 : Board Collector: 1973 Ken Bradshaw shaped Lightning Bolt single fin pin tail. 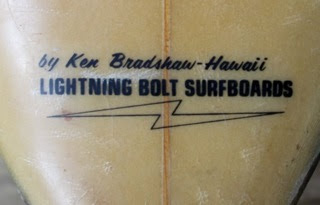 1973 Ken Bradshaw shaped Lightning Bolt single fin pin tail. I have decided to define my collection as a 'Modern Era Collection'. That means it needs to be book ended by a classic 70's Hawaiian bulit Lighting Bolt single fin at one end and a Simon Anderson shaped Energy Thruster at the other end. I am following John Melius's definition of the begining of modern era as portrayed in his movie Big Wednesday when (the real) Gerry Lopez put (fictional) Matt Johnson to shame with him inovative hot dogging and deep tube riding on his newly developed Lightning Bolt template. 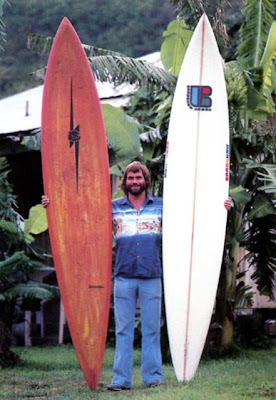 I end the modern era in 1981 with the invention of the Thruster and the following wave of uniformity that swept the industry with white 3 fin boards emblazoned with oversized logos that strangled the art of surfing for the next 25 years. 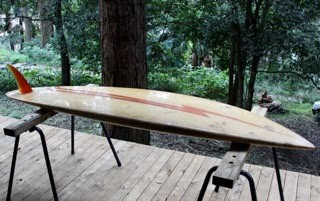 The problem was I didn't own an Hawaian built Lighting bolt single fin although I do have a hand full of beat up thrusters. So I set to work finding an early Bolt in my price range (under $300) which was'nt easy cause a lot of them are fetching over $3000 these days. I found and bought this board a while ago from Criag's list in LA but could not get it home. It had been waiting patiently, many months in fact, at my good friend Mark's house before I could get it on a plane. I post these photo now as part celebration of our unification and as the first part of the 'before and after' shots because as you can see, she is going to need a lot of love to get her back in shape. When I finally got her home this week the thing that struck me about this board was how serious and how scary it is. It is 7'0" and heavy. Heavy with the weight of a glass job built for getting down the face of some heavy, hollow waves. A glass job layered on knowing that it was gonna be taking some serious beatings over some shawllow Hawaiian reefs. It is thick. Thick for paddling into some ledging barrels as early as possible. The tail is so narrow, like a water ski. 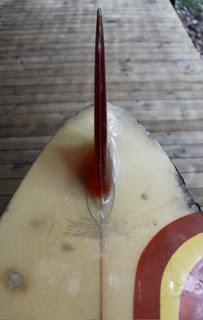 And the fin is thick, thicker than my thumb cause a bit of drag is not important where this board is from. But what is worse, scarier, is its cracked around the base. Cracked thru an inch of glass. It makes me shiver thinking about how fast you'd be going and how shallow the rocks were when this thing was cracked. Nice find Damion - is that 'round the bend' race track detail disguising a dud bolt design? Hope California was fun.